An asphyxiant is a substance that can cause unconsciousness or death by suffocation (asphyxiation). Asphyxiants which have no other health effects and are sometimes referred to as simple asphyxiants. 29 CFR 1910.1200, the OSHA Hazard Communication Standard, defines a simple asphyxiant as a substance or mixture that displaces oxygen in the ambient atmosphere, and can thus cause oxygen deprivation in those who are exposed, leading to unconsciousness and death . Asphyxiation is an extreme hazard when working in enclosed spaces. Be sure you are trained in confined space entry before working in sewers, storage tanks etc. where gases such as methane may displace oxygen from the atmosphere. Be aware that some asphyxiants are heavier or lighter than air and can concentrate near floors or ceilings. See the Further Reading links below for an example of where a worker died from asphyxiation because carbon dioxide invisibly pooled in a stairwell. Asphyxiants work by displacing so much oxygen from the ambient atmosphere that the hemoglobin in the blood can not pick up enough oxygen from the lungs to fully oxygenate the tissues. As a result, the victim slowly suffocates. Examples of asphyxiating gases are nitrogen (N2), helium (He), neon (Ne), argon (Ar), methane (CH4), propane (CH3CH2CH3), and carbon dioxide (CO2). All of the asphyxiants listed above are odorless and tasteless except carbon dioxide and propane that has been commercially odorized. You can become unconscious by inhalation of these gases without realizing they are present. Again, follow OSHA-approved protocols for confined space entry into sewers, storage tanks etc. Also note that some of these materials (methane and propane, for example) are also flammable and can form a flammable mixture in air. Remember also that simple air-purifying respirators or dust masks do not protect you from asphyxiation in an oxygen-deficient atmosphere. 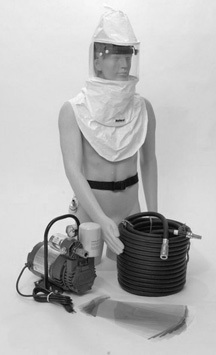 See the first link below for accidents involving supplied air respirators! Under HCS 2012 and the GHS a simple asphyxiant" must utilize the signal word "Warning" and the hazard statement "May displace oxygen and cause rapid suffocation" on both the product label and SDS. 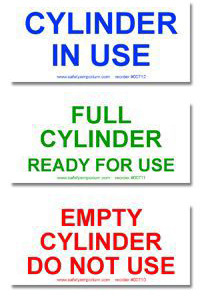 MSDS's and labels prepared before HCS 2012's SDS provisions took full effect in on June 1, 2015 (December 1, 2015 for labels) may lack these indicators. On some older MSDS's the abbreviations S/A or SA were sometimes used for "simple asphyxiant". Simple asphyxiants have no pictogram requirement under HCS 2012. OSHA Fatal Fact Sheet #36 and OSHA Accident 14401913 from 07/17/1985 both discuss a sandblaster who was asphyxiated when his air supply was hooked up to a nitrogen line instead. See also: air, anoxia, asphyxia, asphyxiation, IDLH - Immediately Dangerous to Life or Health.